Does the Melting Pot Still Meld in 2018? A copy of the cover of Forbes Magazine, dated October 30, 1978 displaying the Statue of Liberty. This is currently part of the Endres Collection for the Center for Migration Studies. 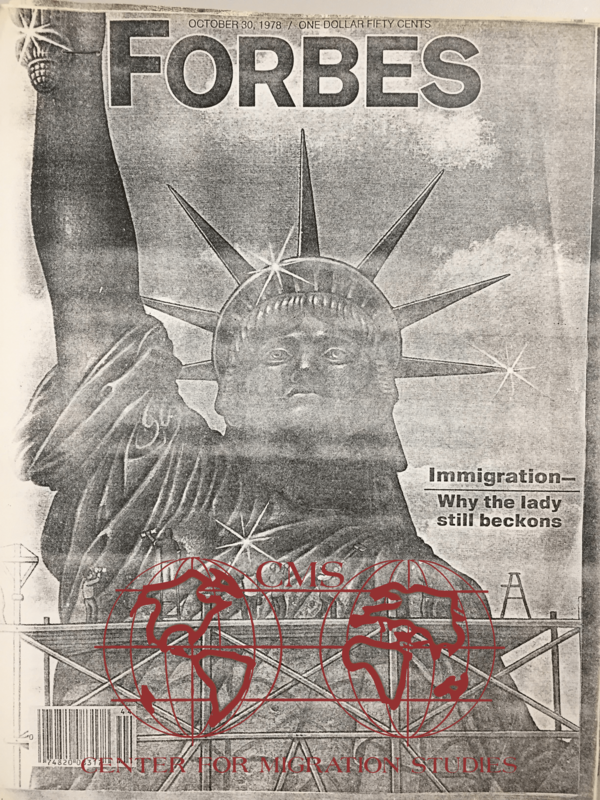 This artifact is a copy of the October 30, 1978 issue of Forbes magazine, which portrays the Statue of Liberty in all her glory, a symbol of American’s immigrant heritage. Give me your tired, your poor, your huddled masses yearning to breathe free, the wretched refuse of your teeming shore. Send these, the homeless, tempest-tossed to me, I lift my lamp beside the golden door! (Moreno 2004). However, this sentiment towards new immigrants has changed throughout the life of America. I believe that views towards immigration, over time, have been based on what America was going through in history. It’s important for us to look back on an article like this and see how far we’ve come – so in this case, I wonder, how far have we come since 1978? This artifact is comprised of a 10-page article titled “Does the Melting Pot Still Meld”? written by Phyllis Berman. Berman describes immigrant stories of coming to America and becoming successful business owners. These stories, along with others that were not so successful, are similar to immigrant stories today. She described events in history that have shaped how Americans felt towards immigrants in 1978. Immigration policy is a quintessential expression of national values, identifying those traits that Americans value or dislike (Pear 1980). This is evident when Berman describes our nation’s history with immigration policy and the different waves of immigrants that have influenced those policies. Events like in 1924, when the government issued The National Origins Law, with quotas heavily favoring northern European immigrants over those from southern Europe, because Americans felt that northern Europeans founded the nation, and made up a large majority of immigrants to the U.S. Many people felt that this act was racist. Then in 1965, President Lyndon B. Johnson eliminated the 1924 National Origins systems by signing the Immigration and Nationality Act, in a ceremony at the base of the Statue of Liberty in New York Harbor (Infobaselearning.com). By the time of the article, Congress set a single quota for both the Western and the Eastern Hemispheres, ending the dual treatment of immigration for the two hemispheres. Acts of exclusion, like the one in 1924 are similar to acts the nation still tries to impose today. For example, when travel bans were put into place in 2017 by executive orders (Belz 2017) due to terrorist threats and fear. What I can take from this article and my experience today is that sentiments of fear can force a nation to apply laws that could make them exclusionists, which is how the author described the nation many times throughout history. Immigration is the nation’s most misunderstood and unresolved issue (Telzrow, 2006). From illegal immigration to immigration policy reform, immigration can be seen from different points of view – social, legal, religious or economic (Urrabazo 2013) so it’s a complex issue to be resolved. To answer the question – “Does the melting pot still meld?” I believe America is still melding today, in 2018. We continue to be a nation of immigrants from all parts of the world. I also believe that we have come very far since 1978 but we still have more to learn as a country. As an immigrant myself, I have always had a huge amount of respect and gratitude towards America. I have realized the opportunity that was awarded to me when I became a citizen and the civic duty that was bestowed upon me. I feel that I have a duty and a service to preserve my heritage and the history of this country, through artifacts like these, so that we can always remember and respect the events in history and hope that they can shape our views today. Moreno, Barry. 2004. The Statue of Liberty. Images of America. Charleston, SC: Arcadia. Pear, Robert. 1980. “Immigration Anarchy Huddled Masses May Compel Change in Law.” New York Times, May 25, 1980. Telzrow, Michael. 2006. “The Story of Immigration in America”. The New American, Feb 20, 2006. Urrabazo, Ignacio. 2013. “Immigration and Demographics.” Texas Banking 102 (10): 6-6,26. Retrieved from: http://jerome.stjohns.edu:81/login?url=https://search-proquest-com.jerome.stjohns.edu/docview/1448231147?accountid=14068. This entry was posted in Center for Migration Studies (NY) and tagged 1978, Academic Service-Learning, Center for Migration Studies, Endres Collection, Forbes Magazine, history, Immigration, melting pot, Phyllis Berman, St. John's University. Bookmark the permalink.